Many grassroots football clubs looking to start a new team can apply for a £1,500 Football Foundation grant to help them on their way. The Grow the Game scheme, which is open for 2016 applications from 1 February to 10 March, will provide £1.5m of funding to help grassroots clubs in England looking to start teams that cater for adults, girls, boys aged 14+ and disabled players. One of the Foundation's most popular schemes, Grow the Game is designed to help clubs with the associated costs of setting up teams that will increase participation in these under-represented groups, for whom opportunities to play are limited. £1,500 is available for each new team that a club creates, to help cover the costs incurred for league entry, referees’ fees, FA coaching courses, football strips, first aid kits and more. Football Foundation ambassador and Sky Sports News anchor Hayley McQueen, said: “The Grow the Game scheme is an excellent chance for grassroots clubs to expand and get coaches qualified. I think getting more people playing sport is very important so to give football teams the resources to do this is fantastic to see." Funded by the Premier League and the FA, Grow the Game is delivered by the Football Foundation, the nation’s largest sports charity. 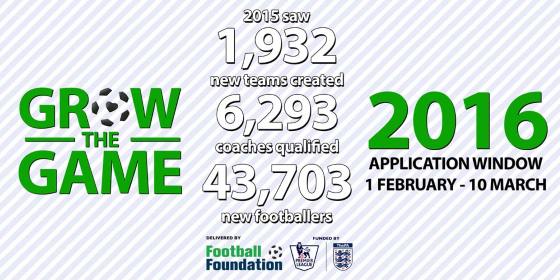 The Grow the Game application window is open from Monday 1 February to Thursday 10 March 2016. 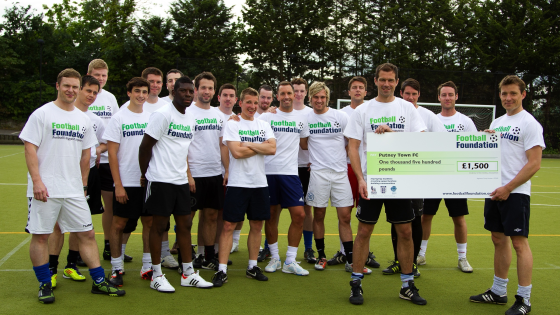 To find out more contact your local County FA or visit footballfoundation.org.uk.